Anyone that has used twitter for more than a week could tell you that fake accounts have flooded this service in the past year. Companies have figured out that people follow the twitter trending topics very closely. Now if you are Toys R Us you can pay twitter boatloads of cash to be the top PROMOTED topic of the day and sit at the top of the "trending topics in NYC" page. However, everyone has grown to ignore these promoted pages because we know they are ads. Enter the bots. Power spambot companies know that early in the morning it might only take 1,000-1,500 tweets with a certain Hashtag to become a trending topic. Almost every day at some point during the day Walmart suddenly becomes a trending topic in NYC. Now this is particularly odd since there are no Walmart's in Manhattan. Are all of these Manhattan tweeters suddenly getting jazzed about a trip to the Secaucus Walmart at the same time? "Need to pick up milk at #Walmart?" "Does #Walmart have any sales this week?" "
"Anyone seen this Black Friday ad from #Walmart?" and blast twitter with them in a fraction of a second. Instantly, it gives the appearance that Walmart must have something interesting going on because it is trending. However, it's just another type of advertising that is not a promoted ad, just an artificial level of interest created by spambots. Anyway, the point here is that we are entering a very dangerous time as it relates to these start-ups and their desire to get rich quick. The next wave coming is self-destructing/private messaging - snapchat (whose messages don't really disappear - make sure you tell everyone you know about this fact), wickr (encrypted person to person messaging), mail.ru (promises email not shared with NSA), etc. Snapchat turned down a $3 billion offer from Facebook and is probably going to raise money at a valuation between $4-6 billion soon. That is a lot of incentive to cheat. I'm not saying that snapchat and these other services are lying, but if you are snapchat and the only measure anyone cares about is messages sent would it be in your own interest to allow or possible even encourage spambots to send images to users and maybe even send messages to other spambots? Imagine a day when someone builds a "hot new app" for messaging. They get 10 users and then hire 500,000 robot accounts to send "encrypted" messages back and forth. The robots send 10 messages/day for the first month, 20 the next, 40 the next and soon Wall Street thinks you are the next hot thing because you have 20 million messages per day going across your servers even though it's really just the same 10 people and 500,000 really active bits of software. That leads to lots of free PR and then you hope actual humans start using the service, but it doesn't really matter because you can always just increase the robot message count to show growth and no one can ever test or verify your numbers because "it's encrypted". You're cruising along at 186 mph (note the speedometer on the motorcycle is pinned at 299 KM/H) when an Audi catches and PASSES you. As predictable as dried out turkey and lumpy gravy at Thanksgiving it is once again time for the "Hey, look at these fools camped out in front of a Best Buy" story. These stories are popping up around the country a bit earlier than usual because, well, everything has to be earlier this year(and there are competing reports that say Best Buy pays some of these people to camp out to cause a stir and generate a story but those reports are unconfirmed). I'm only half joking when I say that I expect a story soon on someone camping out on Halloween in order to be first in line for AFTER-Christmas sales. It's the Sunday before Thanksgiving, but for some hard-core shoppers, it's not too early to get in line for the best Black Friday deals. 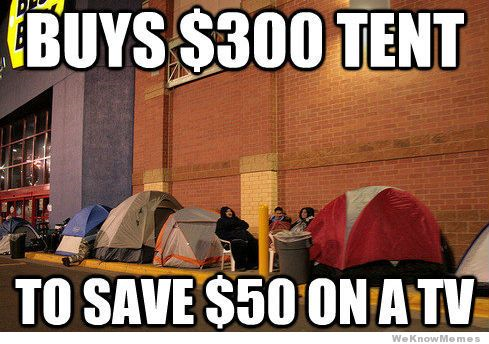 Michael Urso camps at Best Buy every year for Black Friday. "There’s always something to get," said Urso. "I have three kids of my own, my brothers and sisters have kids there’s always something here to buy, new electronics come out every year." For those of you that absolutely can't contain your excitement for the Spending Sea....um, I mean Holiday Season please see dealnews.com's list of the best "deals" this Black Friday. Basically, if you aren't in the market for a giant TV, ipad or phone, most of the deals aren't worth chasing. Element 50" 1080p LED HDTV for $229 at Target *designed to be a throwaway TV. Apple iPad mini 16GB WiFi Tablet with a $100 Walmart Gift Card for $299 at Walmart *note this is the old model. Apple iPhone 5C 16GB Smartphone with a $75 Walmart Gift Card for $45 at Walmart *again requires a new 2 yr agreement. HP AMD E-300 1.3GHz 16" LED-Backlit Laptop for $178 at Walmart * this is a deal, but comparable laptops are online for $185-$195. Apple iPad Air 16GB WiFi Tablet with $100 Target Gift Card for $479 at Target *Does anyone still buy iPads? Microsoft Surface 10.6" 32GB Windows RT Tablet for $199.99 at Best Buy - these might be $59.99 by next summer. The stock markets all passed some more round numbers today - 16,000 on the Dow, 1,800 on the S&P 500 and the Nasdaq is just a couple point from 4,000 (though they've all pulled back a bit from the open). These numbers are meaningless, but they make for good headlines. The rally continues unabated as a result of more bad news. Global economic weakness is perceived to mean more stimulus which ultimately leads to higher asset prices. My big concern is that companies have been conditioned to operate in this environment for too long now. It's hard to generalize, but the pattern that is revealing itself is large corporations continue to defer investments for the future in favor of costs cutting today and stock buybacks. This is a short sighted approach to corporate management but it is what the market wants right now. Buyback your stock which drives up the price (reduce supply/increase price) and that is an easier option than investing today in a new plant or new employees which might take 5-10 years to yield a return on that investment. This sort of looks like many stock price charts lately. Finally, this story shows that not everyone actually saw the movie "Terminator" - Expert predicts US Army will have 10 robots for every soldier within 10 years. Admittedly, this "expert" runs a company that builds robots for the Army, but it's still interesting nonetheless. Is Butterball is taking tips from Exxon? Every news outlet looking for Thanksgiving story ran with Butterball's press release over the weekend that it's going to be a Turkey-apocalypse. Well, what they really said was there was a shortage of LARGE, FRESH turkeys. 1) Who knew Butterball even sold fresh turkeys? I presumed they just sold those large frozen bowling ball turkeys. 2) The "shortage" is only for fresh turkeys over 16lbs. I'm not sure I've ever seen a 16lb fresh turkey. However, the seed has been planted. Now, every retailer in American can pump up the prices of ALL turkeys because "Well, didn't you see that there is a turkey shortage?". This is sort of like when Exxon or Chevron says they are shutting a drilling platform because of a hurricane or when a refinery closes for routine maintenance, which pumps up oil prices and gas prices for everyone. The number of smart people that are lining up on the side of - we're in another bubble/this will end poorly - is starting to get disturbing. The contrarian in me says, "uh oh, if all of these people are expecting a major pullback in stocks and another credit crisis then the opposite may happen". However, many of these people tend to be right over the long-haul so they are worth listening to. While there is no direct corollary between QE3 and rising stock prices, the suppression of interest rates makes assets seek higher returns elsewhere which typically means stocks. There's no hard evidence that this should be the case, but the standard rebuttal is "Well, it just makes stocks go up." We've discussed at length the fact that the Fed has painted themselves into a corner and must begin to wind down QE at some point in the next 6-9 months. My current opinion is that it feels like the fall of 1999 and 2007 all wrapped into one. In 1999 we had a bubblicious tech/dotcom fueled stock market that rose to unreasonable levels as new concepts came to market and we were trying to evaluate the value of these new technologies. In 2007, we had a housing bubble fueled by low-rates and lower lending standards. Today, the bubble in venture capital and stocks is very real. Traditional companies are growing their bottom line through cost cutting and very few are seeing revenue growth (hence the race to open earlier and earlier on Thanksgiving - but that's a topic for another day). Twitter is an unprofitable company with $500 million in revenue valued at $30 billion. The most recent winner of a large technology hackathon in SF was a site dedicated to raising money for other startups. The incubator craze of 2000 really marked the beginning of the end of first bubble and I think we're approaching that point here. However, I'll note that there was an explosive "blow-off" in the market as the bubble burst. This could happen again at some point and it will be hard for those predicting a correction to stick with that call if stocks jump another 10%-20% in their face. The current housing bubble is very interesting. This bubble has been driven by perception. Very large investors have decided housing can be an asset class and have bought up huge portfolios of homes around the country. This gives one the perception that inventory is falling, however, many of these homes remain vacant so they are removed from the "for sale" inventory but they remain in the virtual inventory as unoccupied and unavailable for rent. The average consumer doesn't see this and just takes the "comps" fed to them and overpays for their home despite the fact that 1/4 to 1/2 of their block may be vacant. When these large investors start leaking inventory back into the market this has the potential to be very bad for the average homeowner. So on that cheery note enjoy your 11/12/13. Yesterday, a market commentator implied that the only people left trading this market are computers (robots in his terminology) and drug fueled day traders. Sometimes, I think that's a pretty fair assessment. So after a single day in the red which everyone failed to notice because of all of the twitter hype, the market exploded higher today on the back of a stronger than expected jobs report (more on that in a moment). There was a very specific market player that goosed the market with huge purchases all within seconds of one another. The end result was a market that never let up and got it's typical 3:30pm run to hit another all-time high. Once again this was a very confusing report because of the impact of the laid off Federal workers who filed for unemployment but were ultimately fully restored and paid their back wages. The strength in this report continues to exist in the low-end (retail and service industries) but who cares, right? I waitress equals an engineer at Lockheed Martin in terms of economic impact, right? But I digress. There remains a wide disconnect between the establishment and household surveys but ultimately no one cared today. Here's the ironic thing - most people are betting on the Fed continuing their QE policy through June 2014 because the economy remains so weak. It's a fairly convoluted process but we should remember that the Fed asset purchases are supporting equity prices. Even the hint of a change in the size of QE took stocks down 10% in July. However, I think these jobs numbers significantly increase the odds of the Fed looking at curtailing their QE program as early as December. This would be enormous shock to the system and would lead to a very difficult set of circumstances to understand - an improving economy may lead to lower and potentially much lower stock prices. Final Twitter point - hopefully, you didn't have any market orders in for Twitter because the stock is down about 10% from the first public trade and almost 20% from the peak yesterday. Unfortunately, this stock is going to continue to be very volatile. Those that bought it in the IPO are still up 60% or so, so they are still happy, but those that bought it in the open market might be a little jittery. In keeping with my theme of building products that reduce human interaction, consider this company which has build a wearable sensor which notifies you when your baby has wet their diaper so that you can log off twitter long enough to change them without having to actually listen for them to cry. Now, instead of having to be bothered with checking on your newborn every 30 min or so you can stick them in their sound proof box with their own ipad, while you wait for a "wet" alert. Of course, I'm being sarcastic and I suppose their could be a market in homes for older patients, but when venture capitalists say the ideas they are being pitched are getting more and more ridiculous, I think of ideas like this. I constantly have these conversations with people. 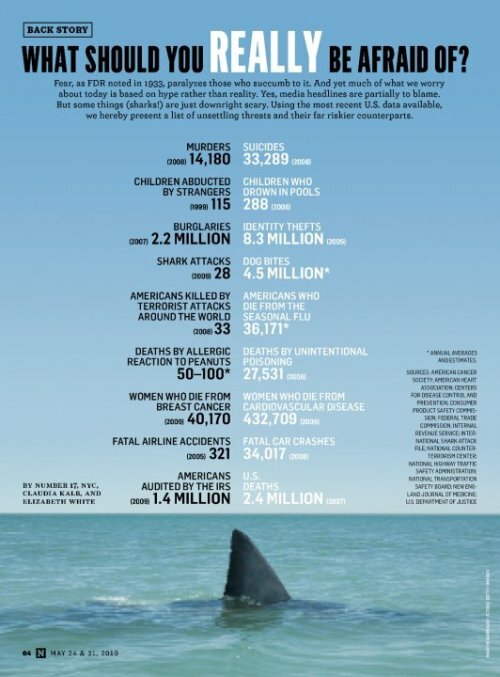 Shark attacks make for terrifying headlines but that dog in your house is much more likely to bite you. You're 1,000 times more likely to die of the flu than you are to be killed by a terrorist. Imagine building a website where you do nothing but sit back and let unpaid minions create content for you! Rather than paying reporters from around the world to report on events they'll give a link for FREE! Now figure out a way to build in some banner ads circa 1995 and PROFIT!! Right now - by market value twitter is larger than Aflac, Chipotle, Gap, Macy's, Charles Schwab, Sprint and Whole Foods. Oh, and remember they've never turned a profit. If you aren't familiar with David Suzuki, let's just say he's kind of like Bill Nye, Neil DeGrasse Tyson and Stephen Hawking all rolled into one. He's a brilliant scientist and an icon in Canada. Well, he was speaking on Halloween at a convention and while he was paraphrasing another's work these low probability events should be on your radar. "Fukushima is the most terrifying situation I can imagine," he said. "Three out of the four plants were destroyed in the earthquake and in the tsunami. The fourth one has been so badly damaged that the fear is, if there's another earthquake of a seven or above that, that building will go and then all hell breaks loose. "And the probability of a seven or above earthquake in the next three years is over 95 per cent." Suzuki said that an international team of experts needs to go into the Fukushima plant and help fix the problem, but said the Japanese government has "too much pride to admit that." "If that isn't terrifying, I don't know what is." "I have seen a paper which says that if in fact the fourth plant goes under in an earthquake and those rods are exposed, it's bye bye Japan and everybody on the west coast of North America should evacuate," he said. You wanna be a billionaire??? I've spent the better part of the past 3 months immersed in the venture capital and start-up worlds (well, as immersed as one can be in Upstate NY). This time has revealed something intriguing about what is considered valuable in today's current environment. In light of this week's upcoming Twitter IPO expect lots of talk about dotcom billionaires again and how the next great idea is probably lurking on some napkin at a dinner near you (the sketch up for twitter was reported done on a single sheet of paper). Well, I'll save you the trouble and get you on your way to riches because I've figured out the common theme among all of the hottest consumer start-ups in the US right now. Help your customer avoid talking to people. That's right take all human interaction out of a transaction and you might be on your way to internet billions. Way, way back in the good old days you had to pick up a phone to call for a car service. For example, you'd dial 777-7777 to get your town car home from work. However, it today's "my phone is my companion" world, customers either can't or don't feel comfortable calling someone for a cab. OH, THE HUMANITY OF SPEAKING TO A HUMAN! Thus, Uber built an app for that and while they are currently private they are valued at north of a billion. Or maybe you needed a dogwalker for Fido when you were heading to a conference this weekend. You could call up Sally Sitters Service but again you must formulate words with your mouth and OH THE HUMANITY!!! So, DogVacay is built and raises $22 million in less than a year (yes, they are just an app that lets you book a dogsitter). Need to crash on a buddy's couch when travelling? AirBnB. You get the point. I'm being a little overly simplistic in my analysis, but there is some merit to the point that as we have become more accustomed to electronic communication we've become less comfortable with traditional communication and the venture capital is flowing to these new methods of communication. A note on twitter because it will be the talk of the town when they go public on Thursday. A) The stock is hitting the absolute peak of frothiness in the market right now. The range is said to be $23-$25, but I expect they'll price it around $28 and it will quickly jump into the $30's or above. B) The problem is that the untold story of twitter is that for all of its benefits, there are a tremendous number of inactive accounts and outright fake accounts. Twitter said up to 5% of accounts are fake but I've seen reports from twitter "marketing" people that would run 1,000,000 plus fake accounts by themselves! With just 250 million TOTAL accounts the idea that 1 guy running a marketing firm could control a million fake accounts should concern any investors. I suspect fake accounts are probably 20% of all accounts on twitter (roughly 1/2 of President Obama's followers were found to be fake) and another 30% of accounts are inactive. There are also a large number of users with multiple accounts but it's difficult to put number on these people. C) The company introduced their new revenue model (Ads in the twitter stream) this week which is ...... wait for it .............. basically the exact same as AOL's revenue model in 1995 - banner ads. However, a lot of people are going to get filthy rich on Thursday so get going on a way to automate your lawn service so that you get your grass mowed on demand and build an app for that so I don't have to talk to my landscaper again! Just a quick PSA - GOAV! We have no statewide elections today so turnout will likely be low. However, there are some important propositions on the BACK of the ballot. Make sure you turnover the ballot and make your voice heard.